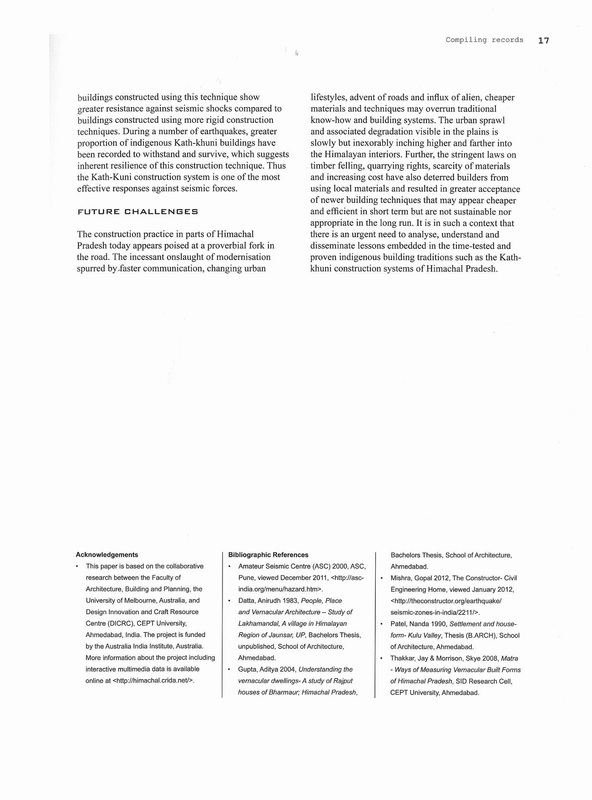 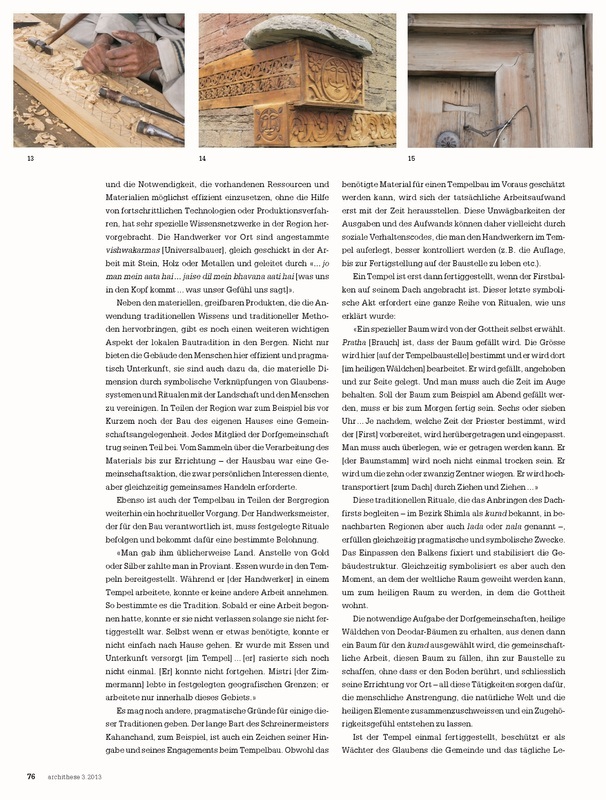 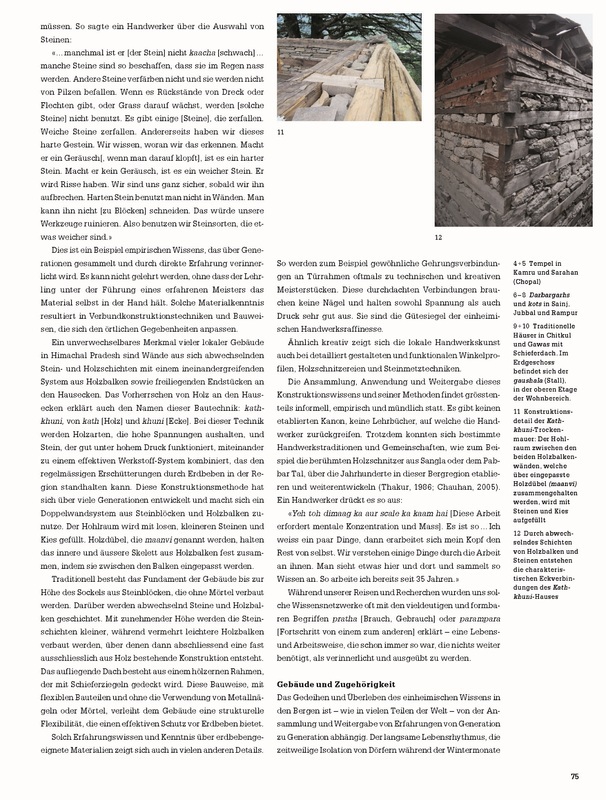 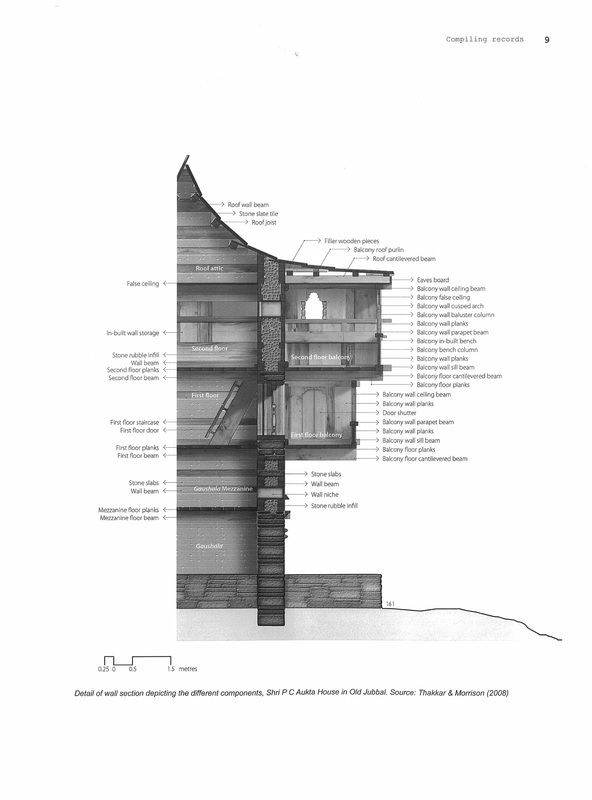 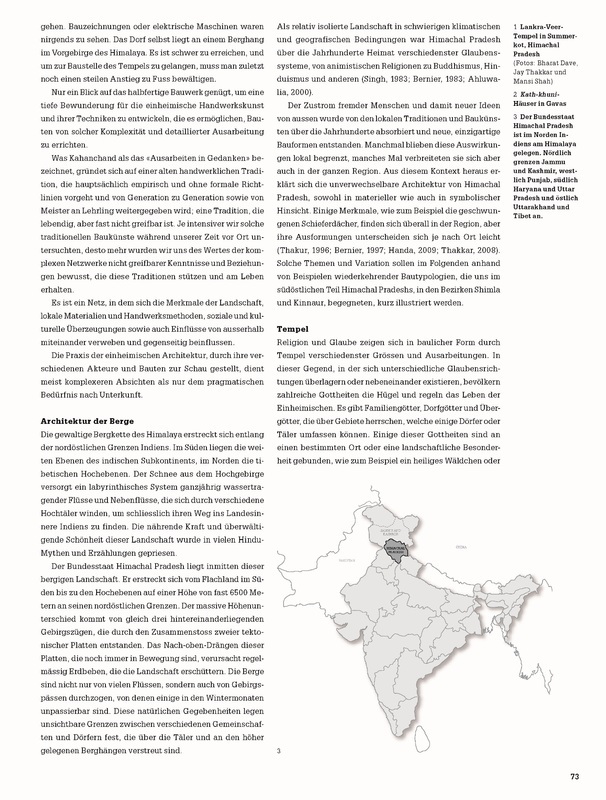 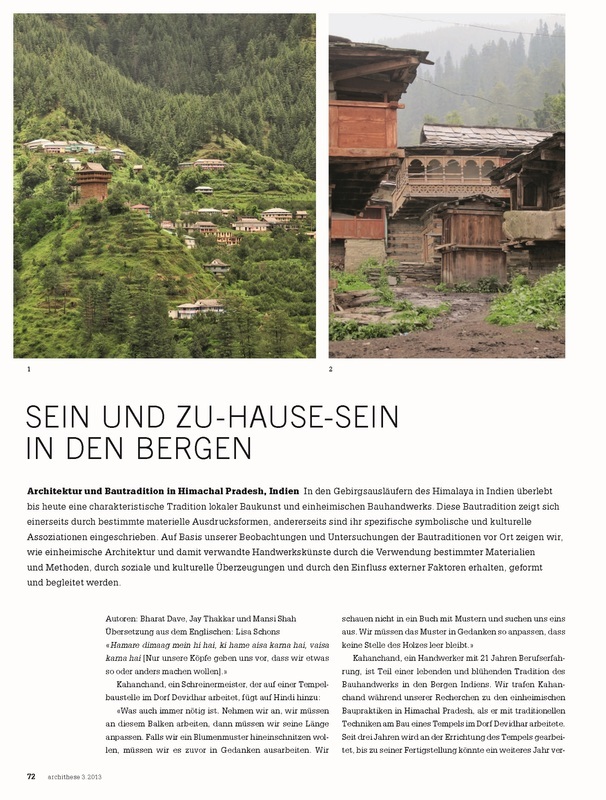 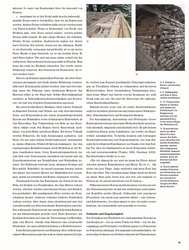 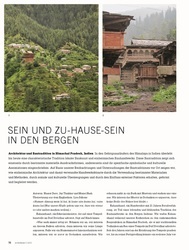 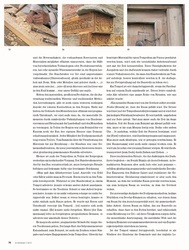 SEIN UND ZU-HAUSE-SEIN IN DER BERGEN: B. Dave, J. Thakkar & M. Shah; archithese: International thematic review for architecture, Zurich, ISSN: 1010-4089, 3May/June (3), 2013, 72-77. 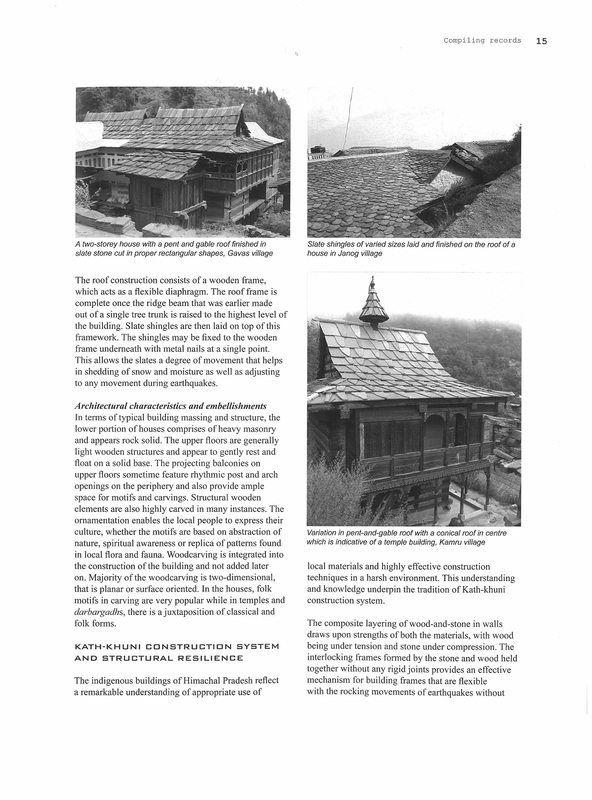 A distinctive legacy of indigenous building practices and associated crafts survives in the Himalayan hills in India. 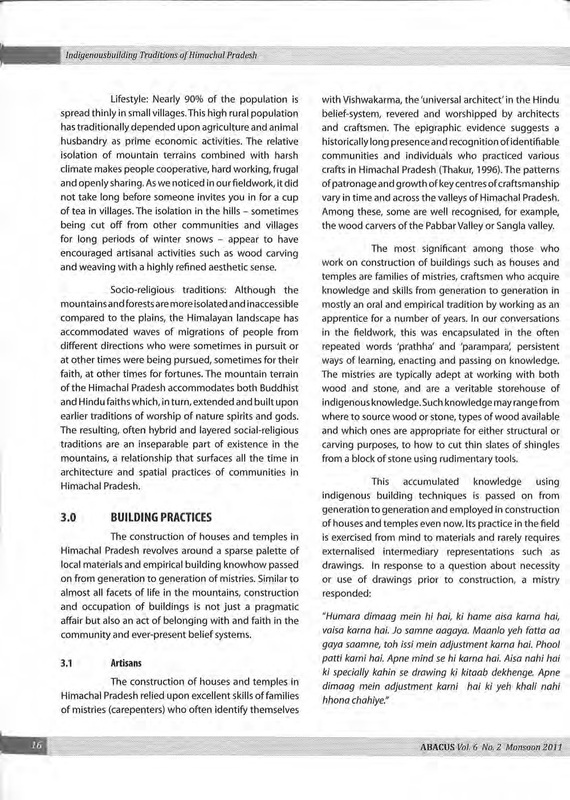 These traditions, on the one hand, represent specific material expressions and, on the other hand, encode specific symbolic and cultural associations. 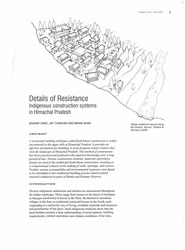 The assemblage of indigenous buildings and their making while discrete in material terms and finite in temporal terms reflects at a deeper level cultural choices about being and belonging in a particular landscape. Based on our fieldwork documentation of building practices in Himachal Pradesh, India, we discuss how indigenous architecture and associated crafts are underpinned by mutually reinforcing material conditions and practices, social and cultural beliefs, and permeability to external influences.that is aesthetically pleasing, seismically sound and sustainable. 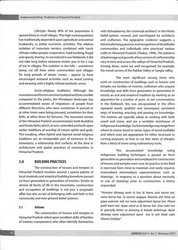 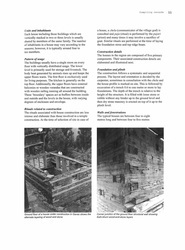 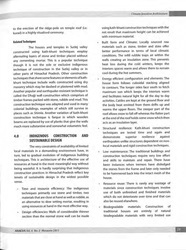 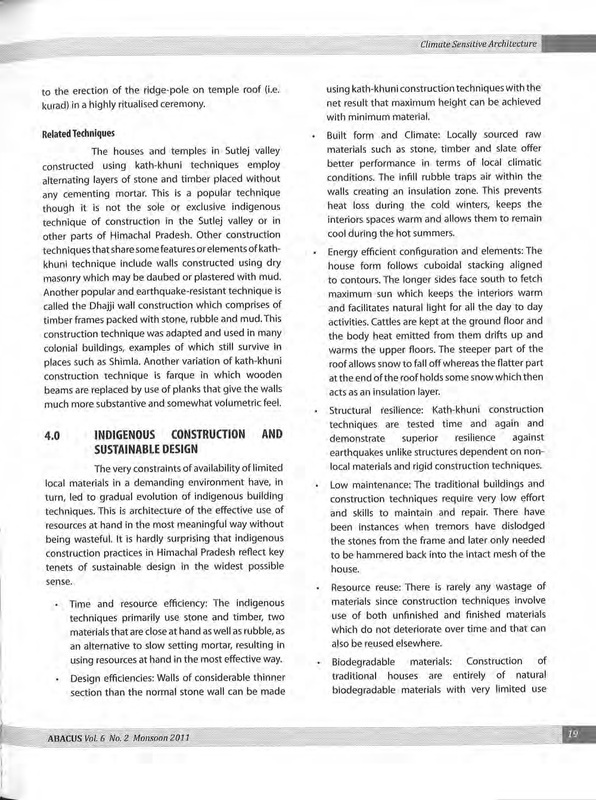 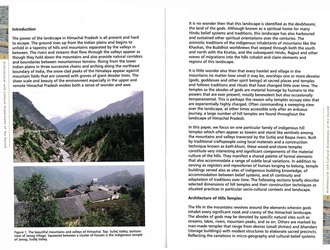 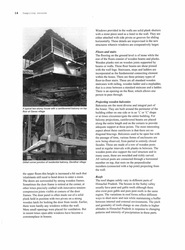 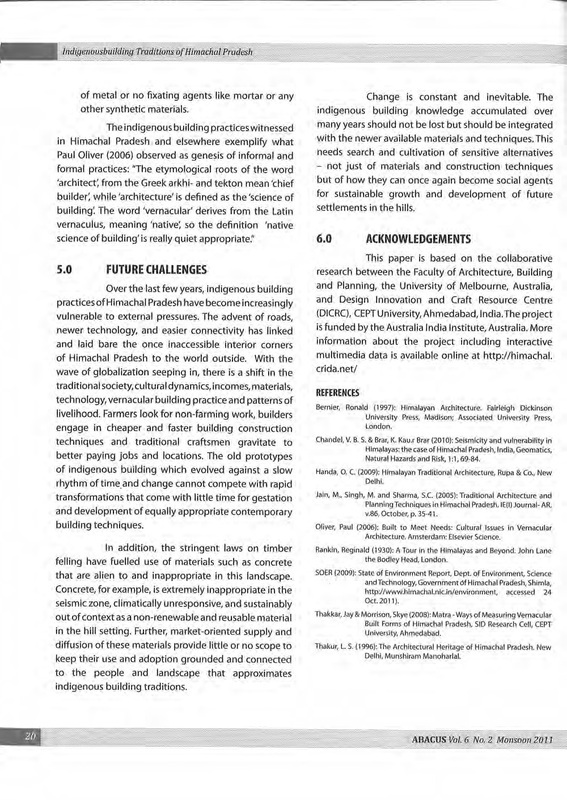 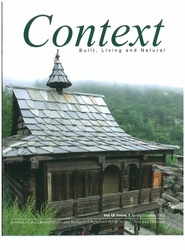 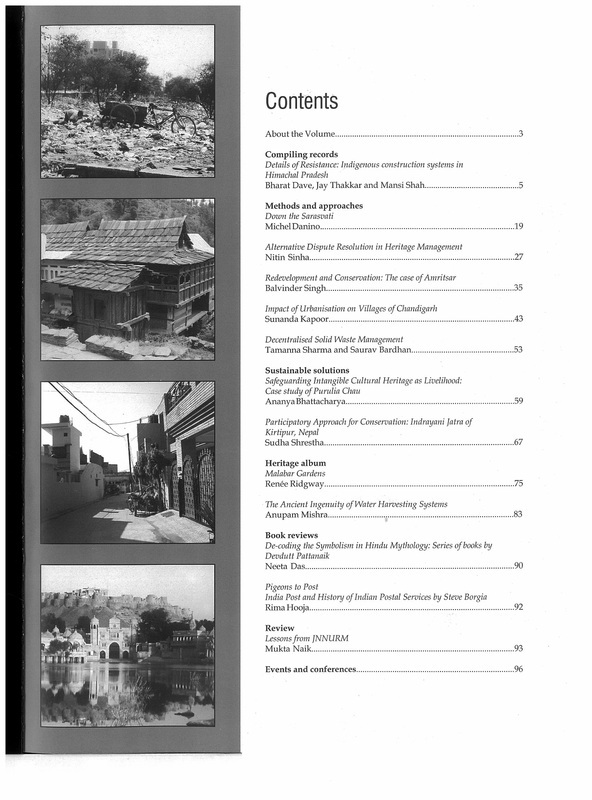 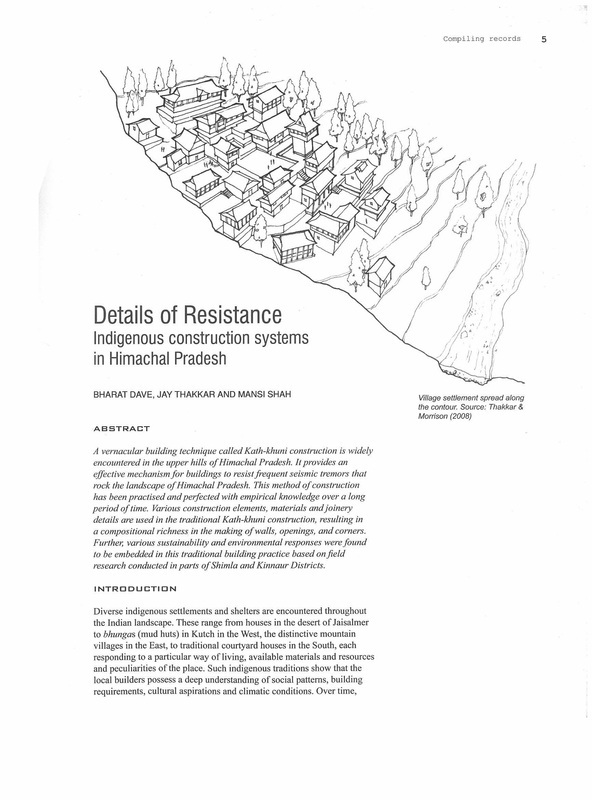 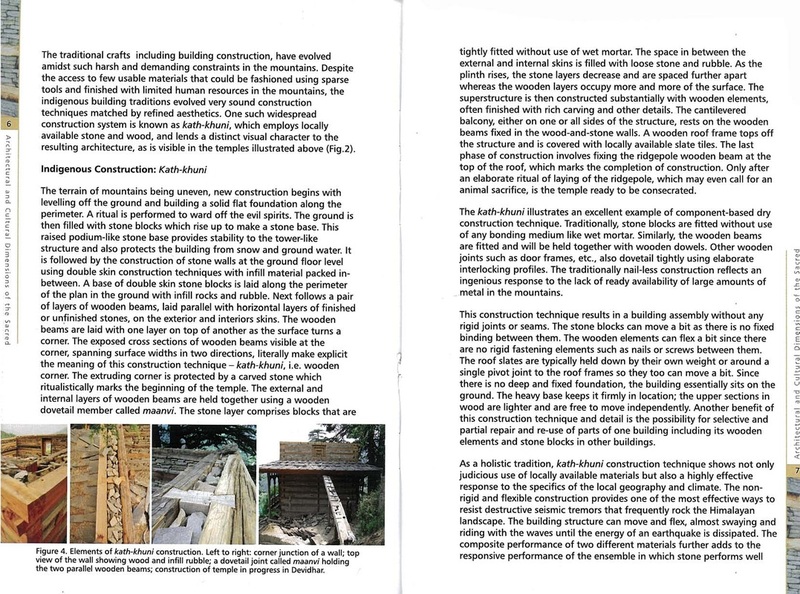 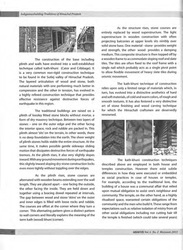 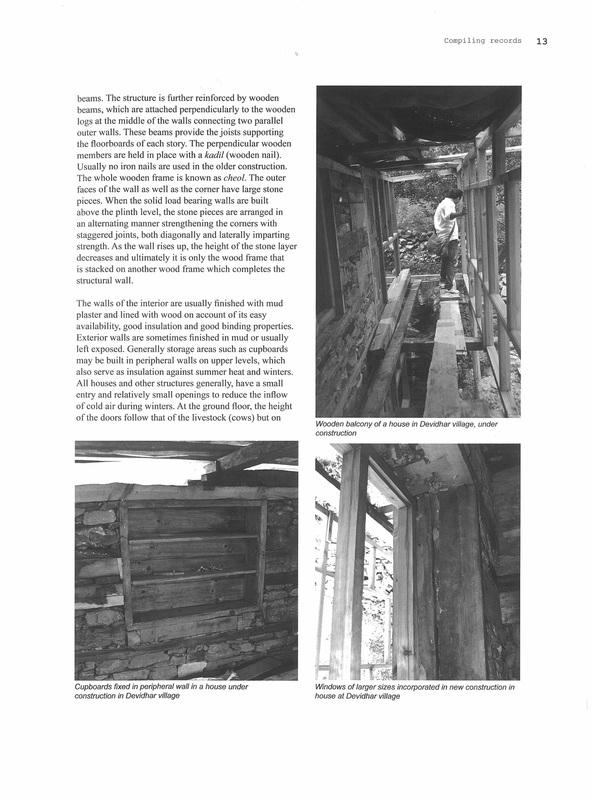 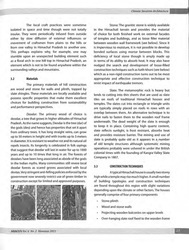 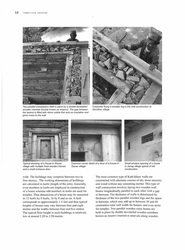 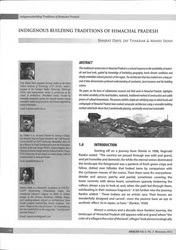 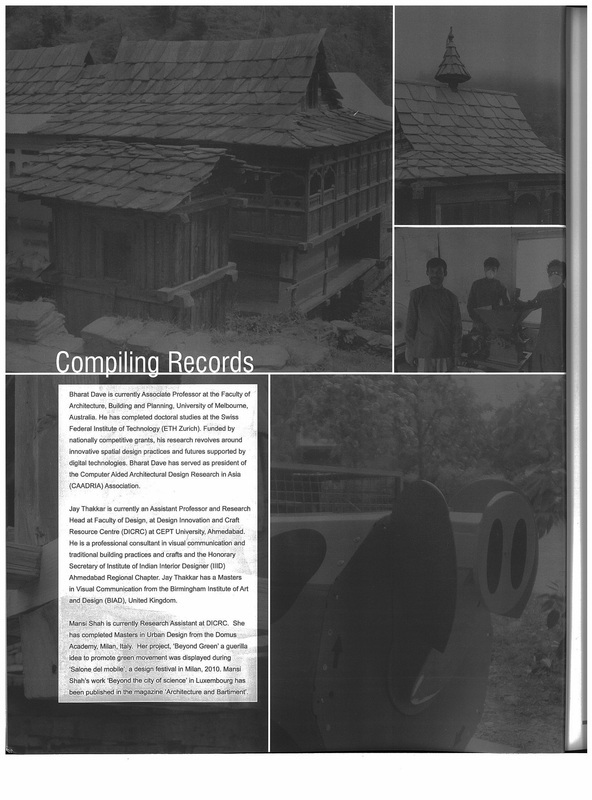 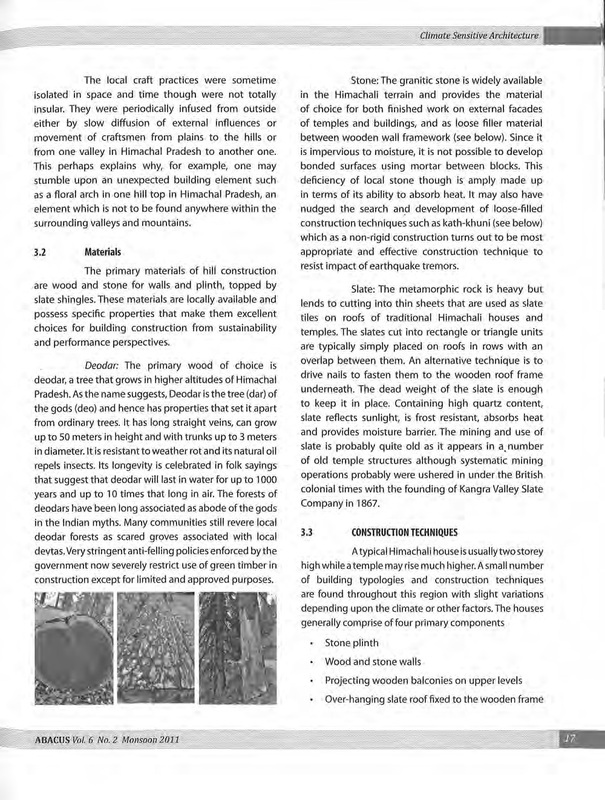 Details of Resistance: Indigenous Construction Systems of Himachal Pradesh: B. Dave, J. Thakkar & M. Shah, Context: Built, Living and Natural, Journal of the Development and Research Organisation for Nature, Arts and Heritage, DRONAH, ISSN 0973-502X, Vol. 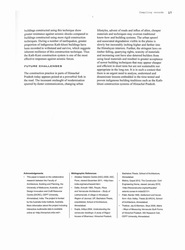 IX (1), Spring/Summer 2012, 5-17. 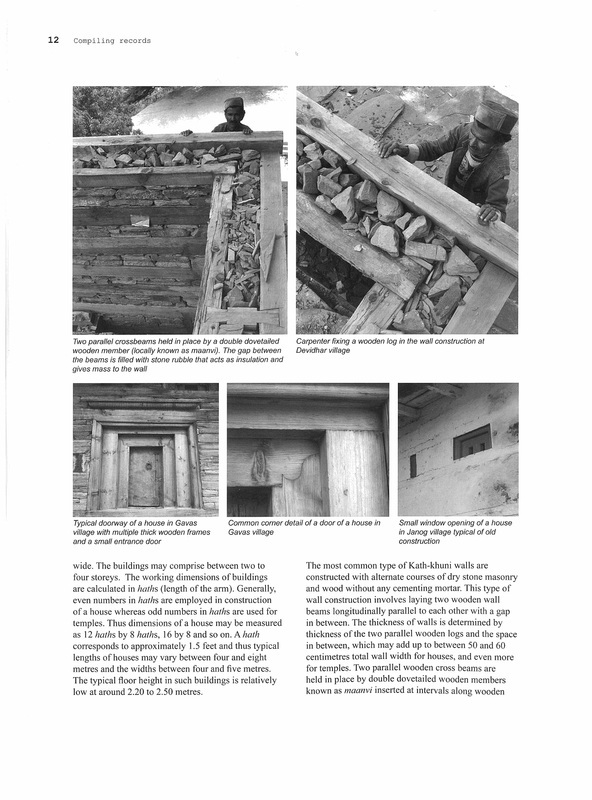 A vernacular building technique called kath-khuni construction is widely encountered in the hills of Himachal Pradesh. 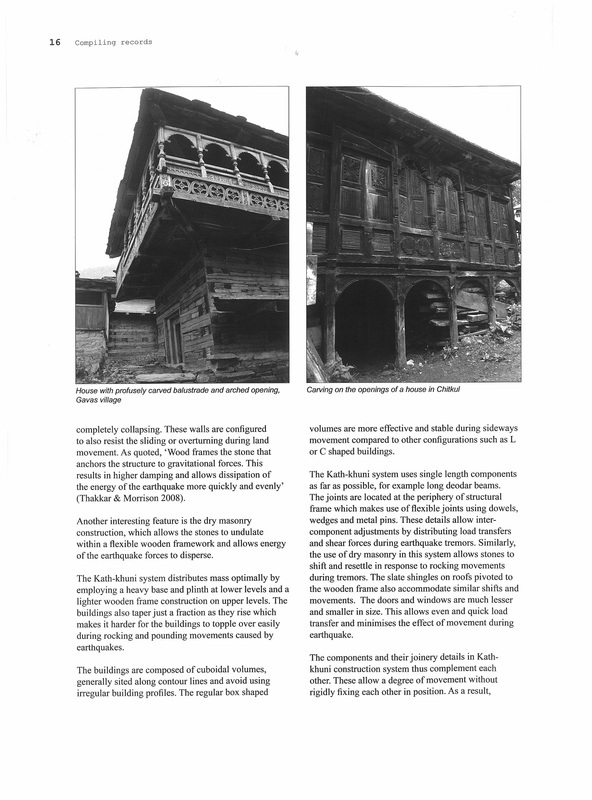 It provides an effective mechanism for buildings to resist frequent seismic tremors that rock the landscape of Himachal Pradesh. 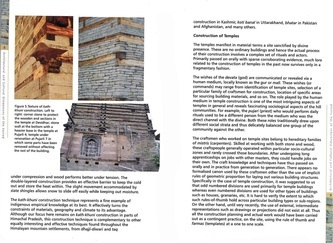 This method of construction has been practiced and perfected with empirical knowledge over a long period time. 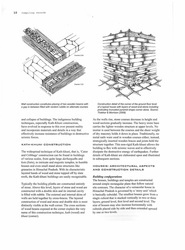 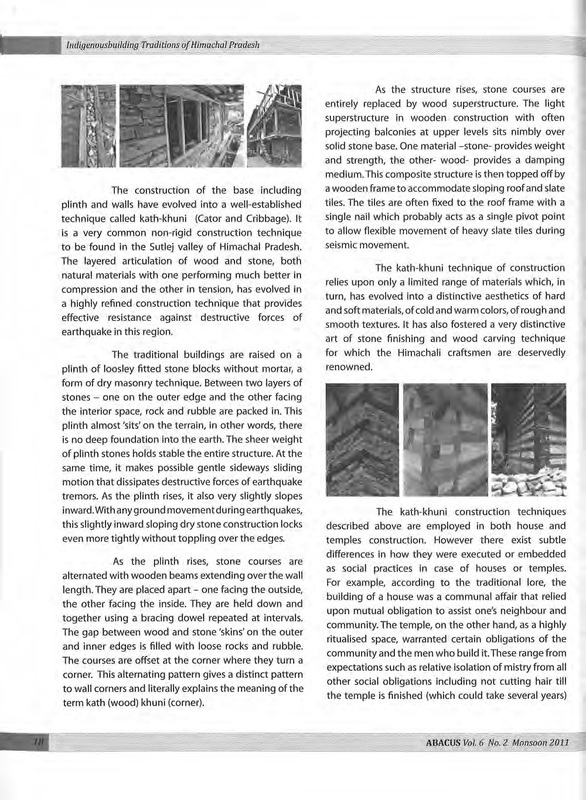 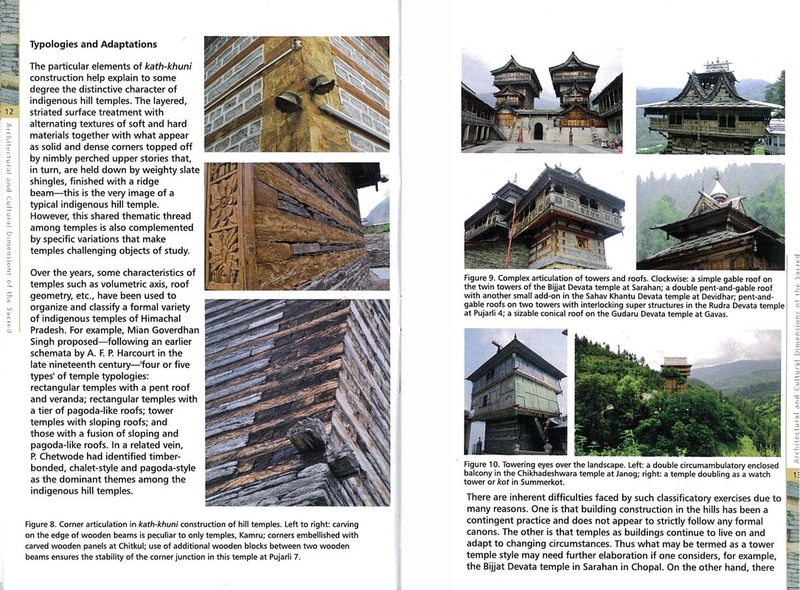 This article describes various construction elements, materials and joinery details in the traditional kath-khuni construction and the resulting compositional richness in the making of walls, openings, and corners. 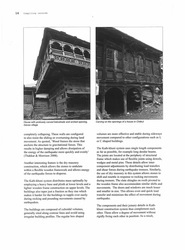 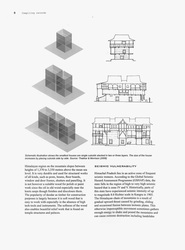 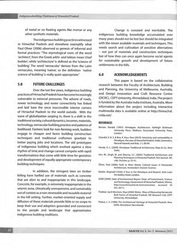 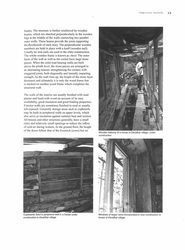 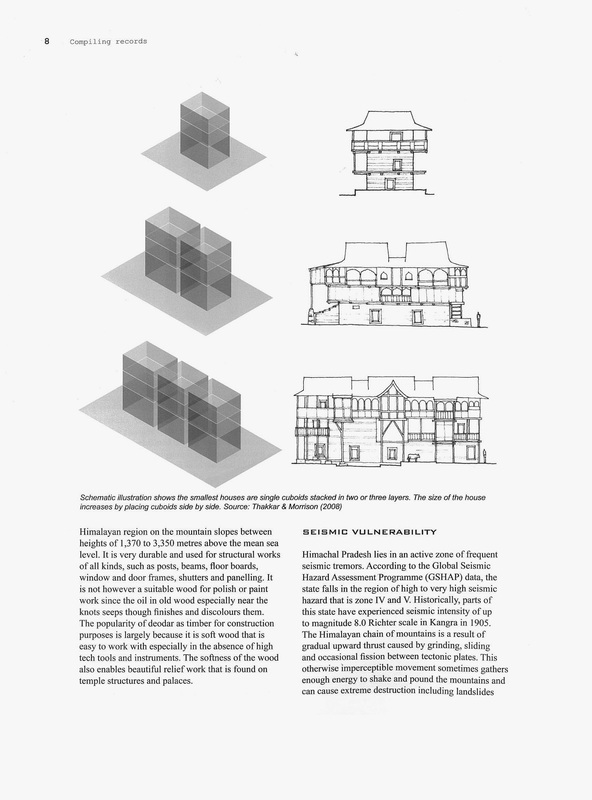 The paper highlights various sustainability and environmental responses embedded in this traditional building practice. 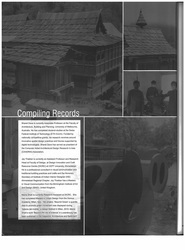 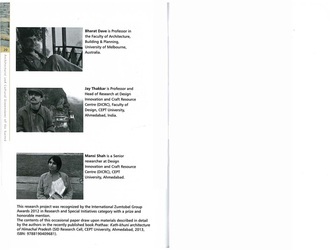 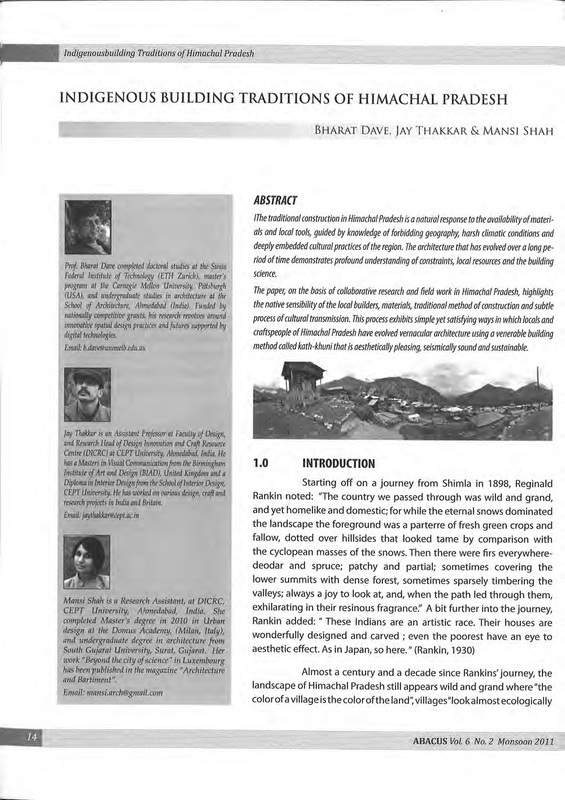 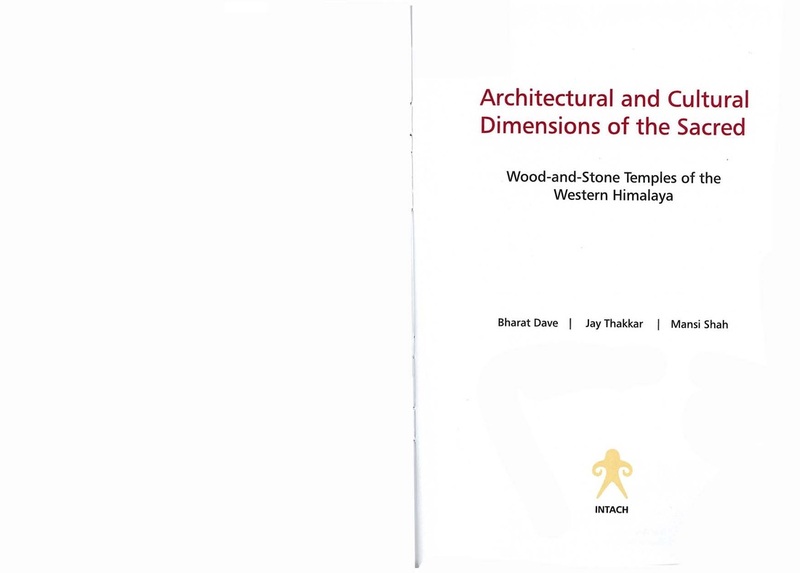 Indigenous Building Traditions of Himachal Pradesh: B. Dave, J. Thakkar & M. Shah. 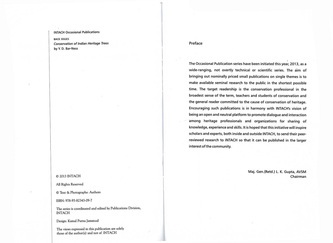 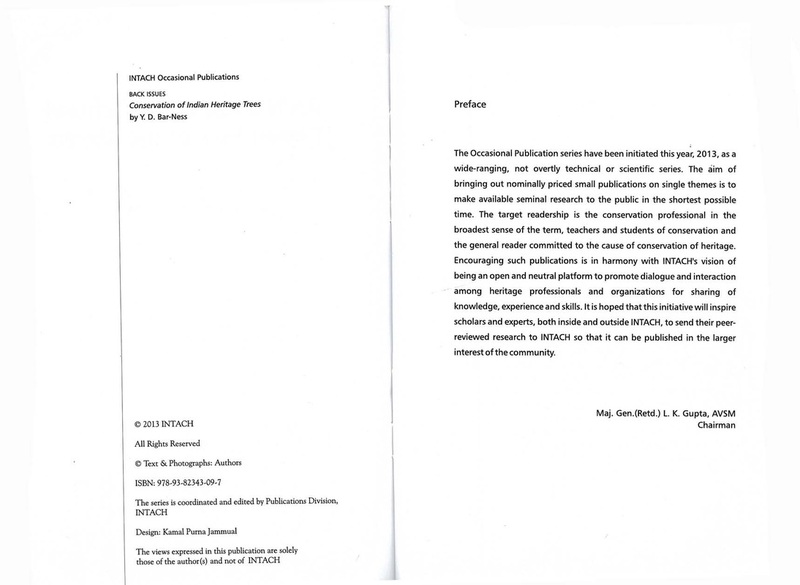 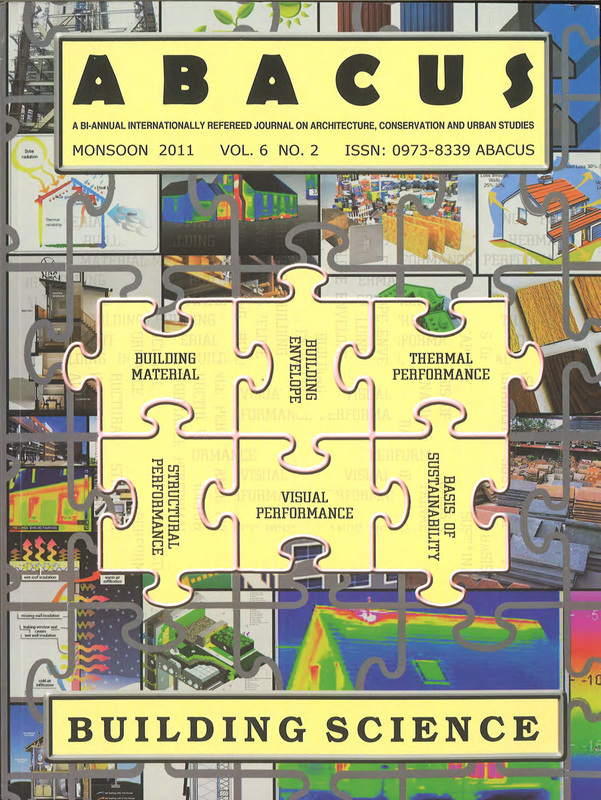 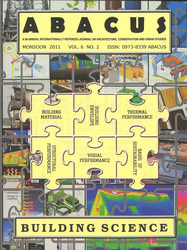 ABACUS, ISSN 0973 8339, Birla Institute of Technology, Mesra, Monsoon 2011, 6(2), 14-20. 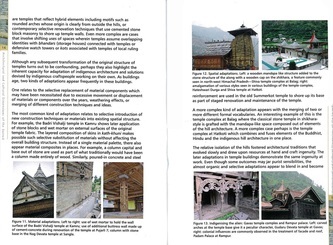 The traditional construction in Himachal Pradesh is a natural response to the availability of materials and local tools, guided by knowledge of forbidding geography, harsh climatic conditions and deeply embedded cultural practices of the region. 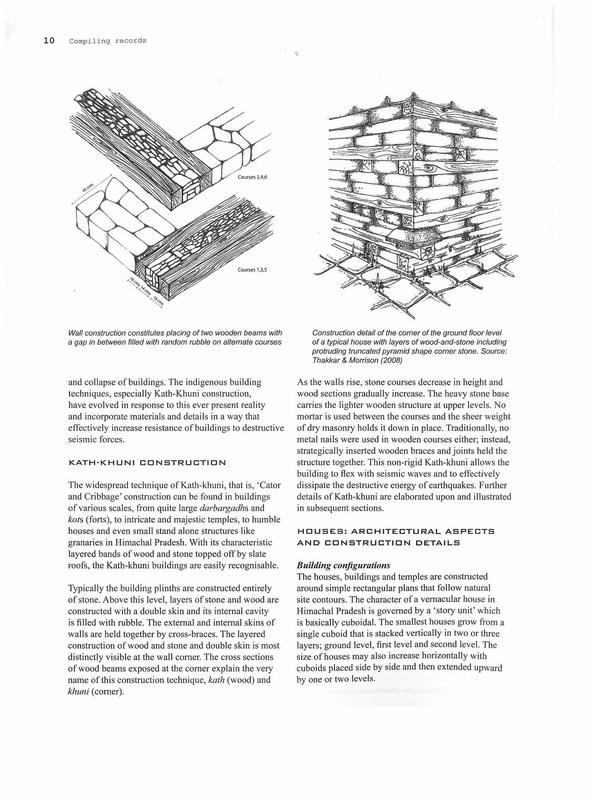 The architecture that has evolved over a long period of time demonstrates profound understanding of constraints, local resources and the building science. 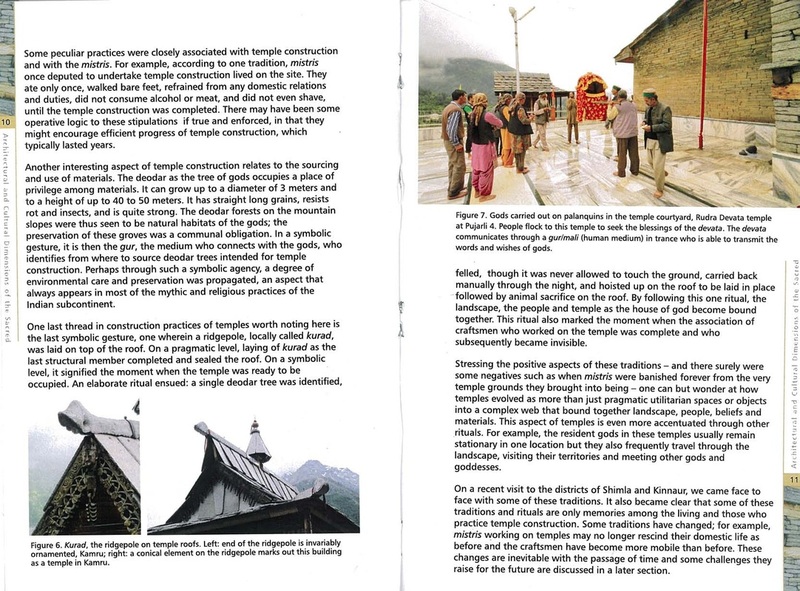 The paper, on the basis of collaborative research and field work in Himachal Pradesh, highlights the native sensibility of the local builders, materials, traditional method of construction and subtle process of cultural transmission. 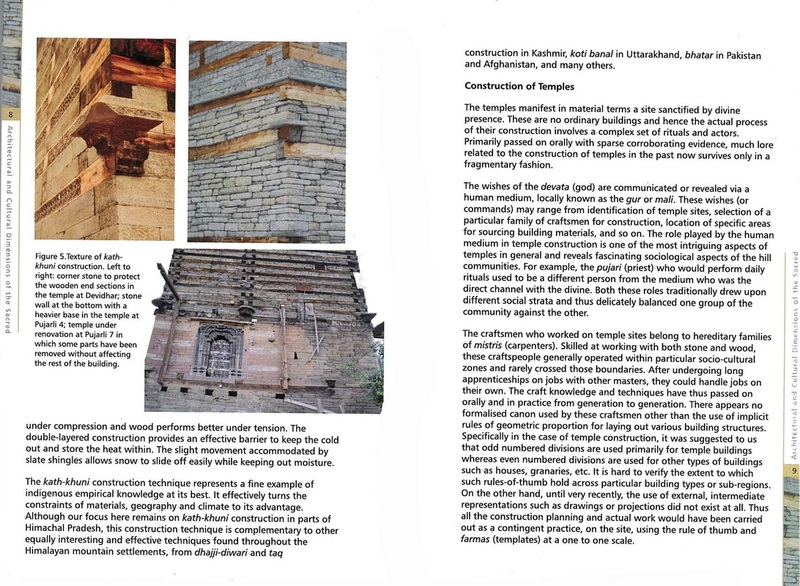 This process exhibits simple yet satisfying ways in which locals and craftspeople of Himachal Pradesh have evolved vernacular architecture using a venerable building method calledkath-khuni that is aesthetically pleasing, seismically sound and sustainable. 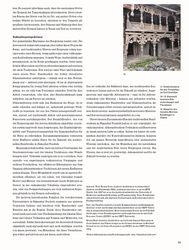 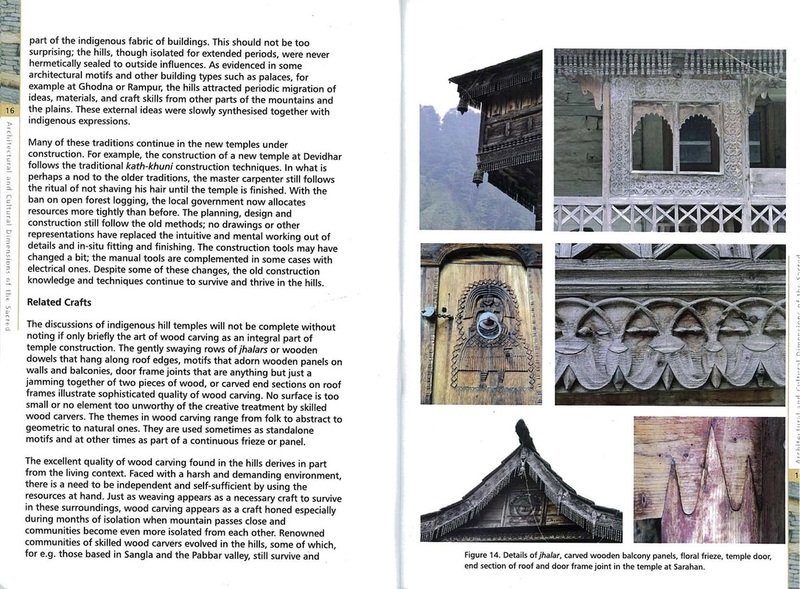 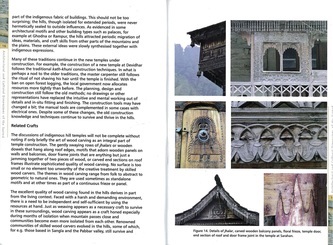 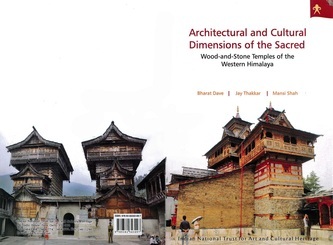 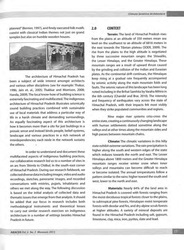 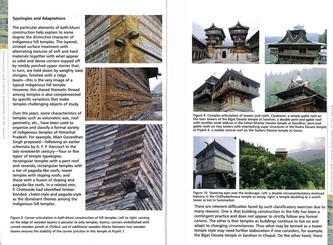 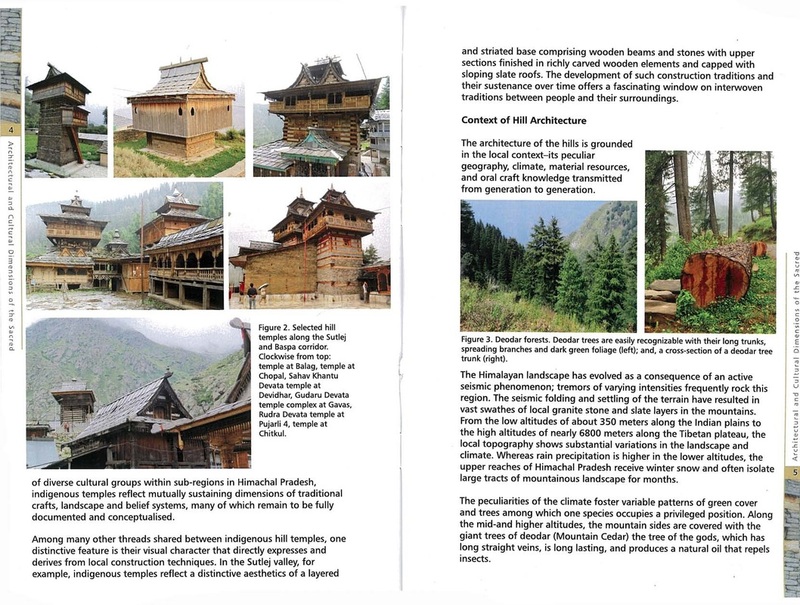 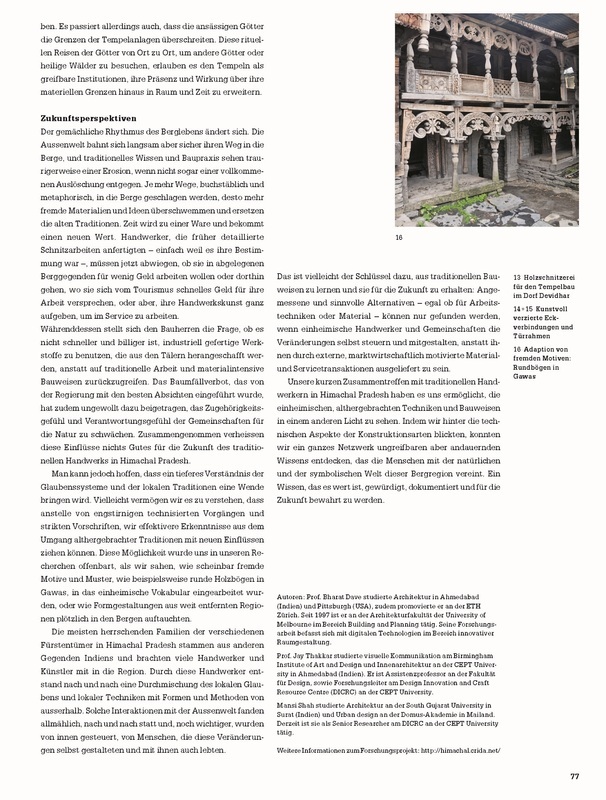 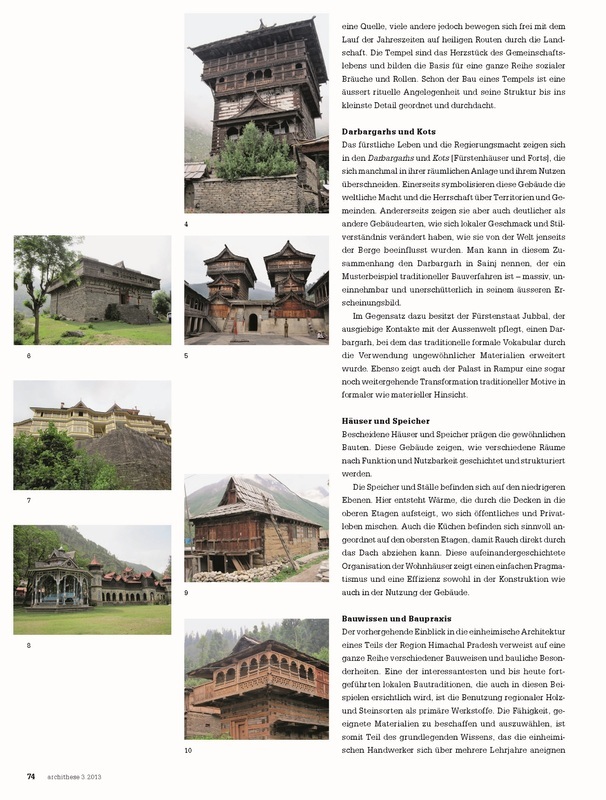 INTACH (2013, ISBN:978-93-82343-09-7) Architectural and Cultural Dimensions of the Sacred: Wood‐and‐stone Temples of the Western Himalaya: B. Dave, J. Thakkar & M. Shah; INTACH: Indian National Trust for Art and Cultural Heritage, New Delhi, ISBN: 978-93-82343-09-7, 2013. 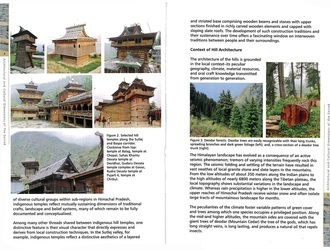 Himachal Pradesh is known also as the ‘land of divine’ or ‘dev bhoomi’. With its relative isolation and demanding climate, it fostered pockets of vibrant and distinctive cultural zones. 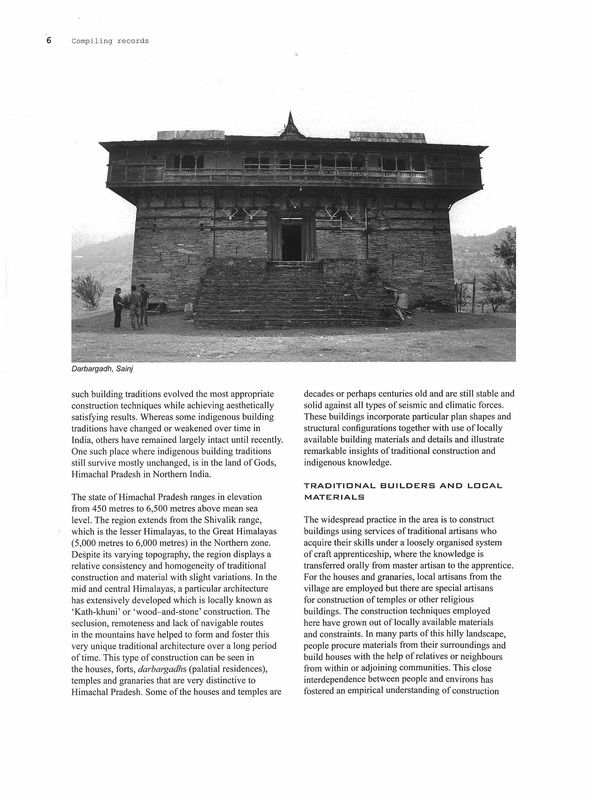 The architecture of indigenous hill temples occupies a special place– both materially and spiritually, in the hills and is evident in a large number spread across the state. 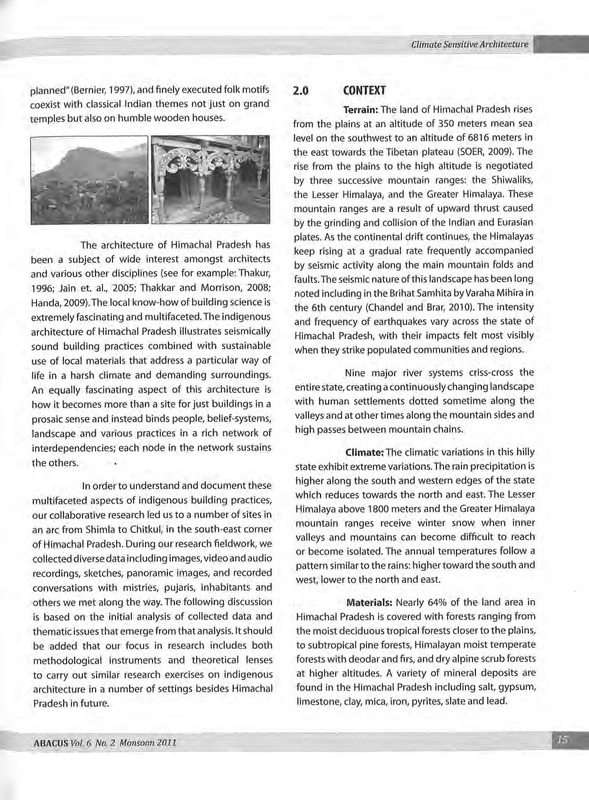 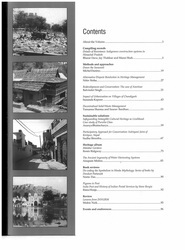 This paper focuses on indigenous hill temples of the western Himalayas especially hill temples. 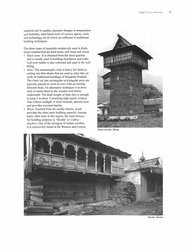 Their architecture is imbued with the character of hills and built by traditional craftspeople using local materials (timber and stone) and a technique known as kath-khuni (cator and cribbage) construction. This particular style of construction has evolved over a long period, handed down from generation to generation via oral lore and material practice. The tower temples reflect a profound synthesis of empirical building knowledge, rituals and space making craft skills resulting in fascinating architectural exemplars. 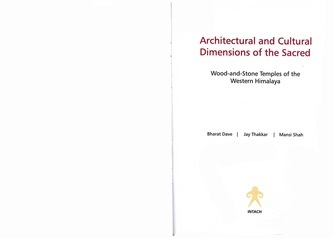 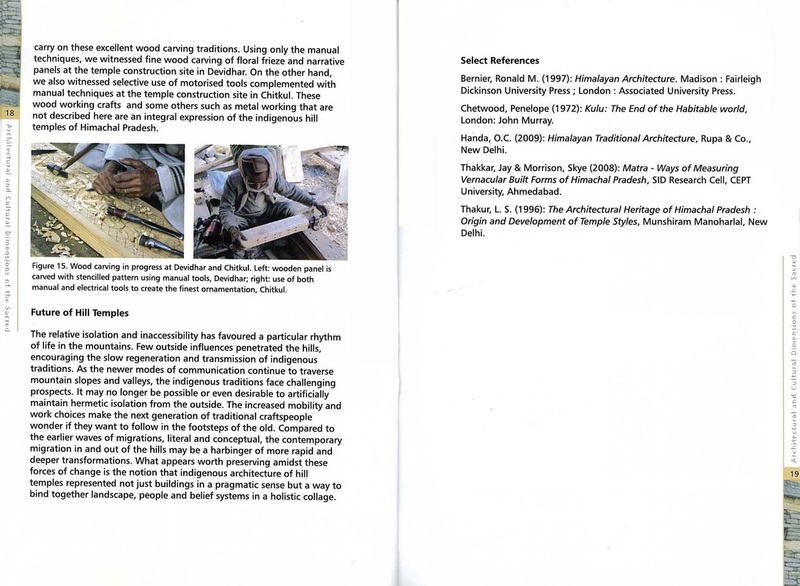 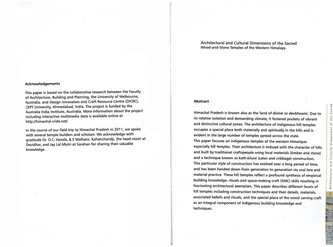 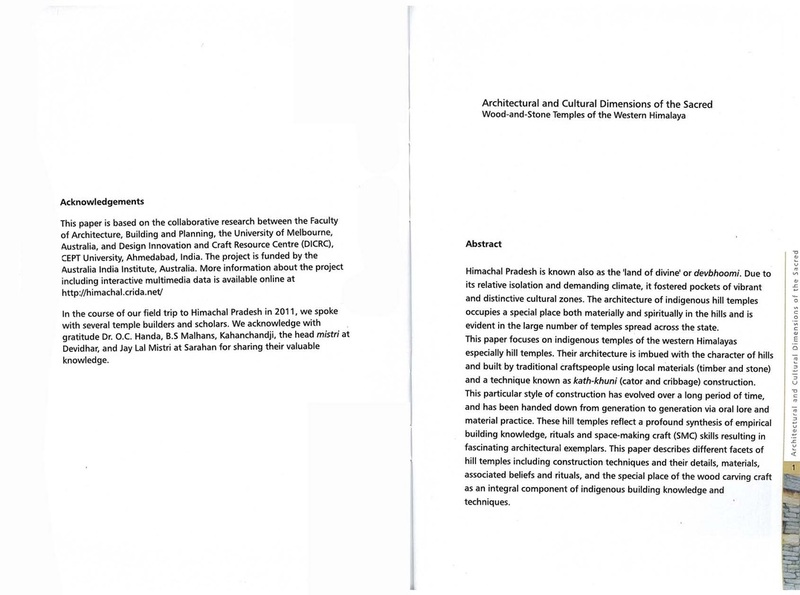 This paper describes different facets of hill temples including construction techniques and their details, materials, associated beliefs and rituals, and special place of wood carving craft as an integral component of indigenous building knowledge and techniques.